A peculiar observation, already reported in ornithological literature, was repeatedly found in the scavenging of Megalobulimus shells by the Lear’s macaw, Anordorhynchus leari Bonaparte, 1856. The shells were broken and little pieces were eaten, presumable for the uptake of calcium. The observations were made in northeastern Brazil. Lima, D.M. et al., 2017. 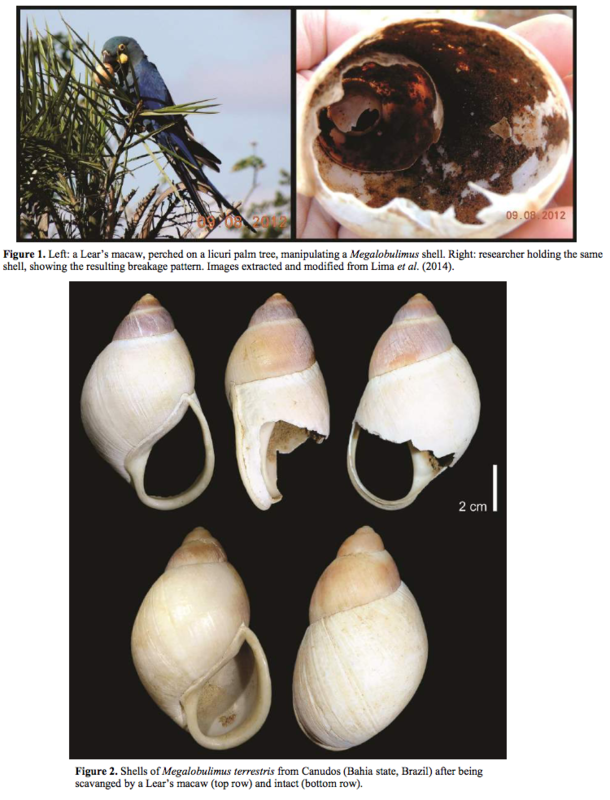 Observation on scavenging events on shells of Megalobulimus (Gastropoda: Pulmonata) by Lear’s macaws. – The Festivus, 49(4): 329-331. This entry was posted in Uncategorized and tagged biology, brazil, literature, Megalobulimidae on November 7, 2017 by bramb. Mirando & Pecora (2017) published an ecological study on the interaction between a native and an introduced species. “The Giant African Snail Achatina fulica is widely considered one of the most invasive species in the world. 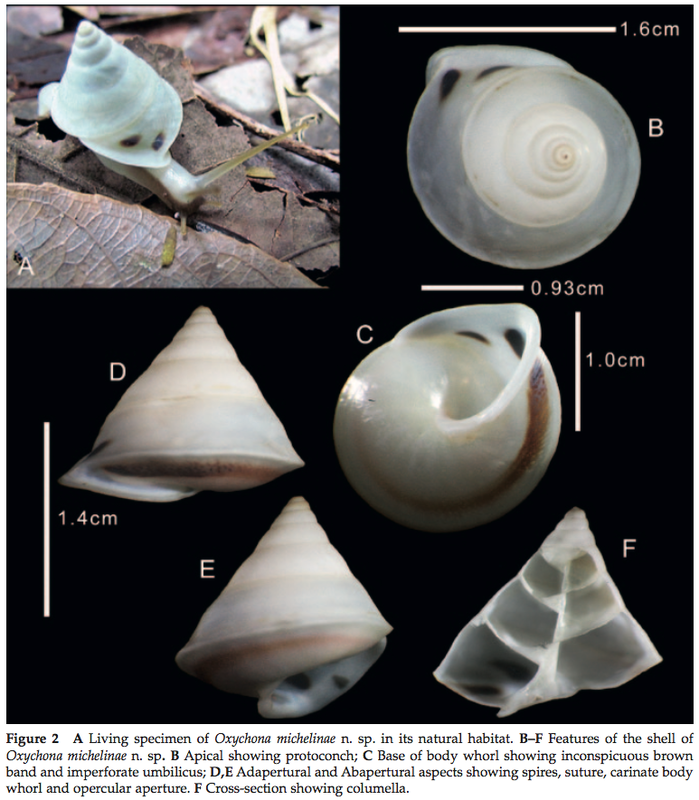 Megalobulimus paranaguensis is a snail endemic to the Brazilian Atlantic Rainforest. Data on possible interactions between A. fulica and terrestrial mollusc species are scarce. 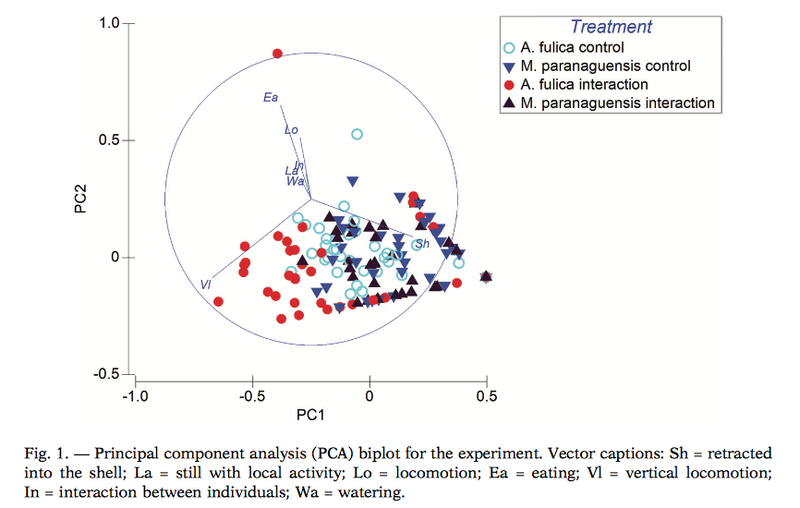 We tested whether the presence of A. fulica affects the behaviour of M. paranaguensis. We put three individuals of A. fulica and three individuals of M. paranaguensis in the same aquarium and quantified the time spent in seven behaviours, during three nights (n = 72 individuals for A. fulica and M. paranaguensis). We also tested the effect of sexual maturity, putting juvenile and adult individuals of both species in the same aquarium. We found behavioural differences between species, among individuals exposed to interspecific interactions and in interactions between these factors, but there was no difference in behaviour between juveniles and adults in the same species and between species. Achatina fulica changed its behaviour in interspecific interaction, becoming more active than usual, but M. paranaguensis did not change its behaviour in the presence of the alien species. Our results show that interspecific interaction has an effect on the behavioural patterns of the alien species, and the main factor negatively impacting Megalobulimus populations in Brazil is probably the non-specific control of A. fulica and the alteration and destruction of its habitats”. This kind of studies, still rarely done, may become more important with the spread of introduced species (unfortunately too often happening). The study will be especially appealing to ecologists and conservationists. Miranda, M. & Pecora, I., 2017. Conservation implications of behavioural interactions between the Giant African Snail and a Native Brazilian species. – Ethology Ecology and Evolution, 29 (3): 209-217. This entry was posted in Uncategorized and tagged Achatina fulica, brazil, literature, Megalobulimidae on May 30, 2017 by bramb. Just published: a paper by Cuezzo & Pena describing a new genus and species of Epiphragmophoridae; their abstract reads as follows “We describe a new genus and a new species in the family Epiphragmophoridae, Minaselates paradoxa sp. n. The new species was found at the National Park Cavernas do Peruaçu, in northern portion of the state of Minas Gerais, Brazil. Minaselates paradoxa sp. n. is classified in Epiphragmophoridae based on the fact that it shares the following diagnostic features of the family: a dart apparatus with a single dart sac, and two unequal mucous glands at the terminal genitalia. Minaselates gen. n. differs from Epiphragmophora Doering, 1874 by having a granulose protoconch, shell spire with blunt apex, complex microsculpture on the teleoconch and closed umbilicus fused with the shell wall. Also, significant differences between the two genera are the presence of a long and thin kidney that extends more than half the length of the pulmonary cavity, the presence of a flagellar caecum, and a smooth jaw in Minaselates gen. n. The finding of this new species and genus is particularly significant to refine the definition of the family, since Epiphragmophoridae has been traditionally diagnosed using the same characters of Epiphragmophora. Dinotropis Pilsbry & Cockerell, 1937, the other valid genus in the family, is monospecific and is only known by the morphology of the shell. In many ways it is similar to Epiphragmophora. A cladistics analysis was made in the present study which supports Minaselates gen. n. as a different entity and as sister group of the Epiphragmophora within Epiphragmophoridae”. This entry was posted in Uncategorized and tagged brazil, Epiphragmophoridae, literature, taxonomy, types on April 28, 2017 by bramb. “Terrestrial gastropods occur in many North African localities in Eocene continental deposits. 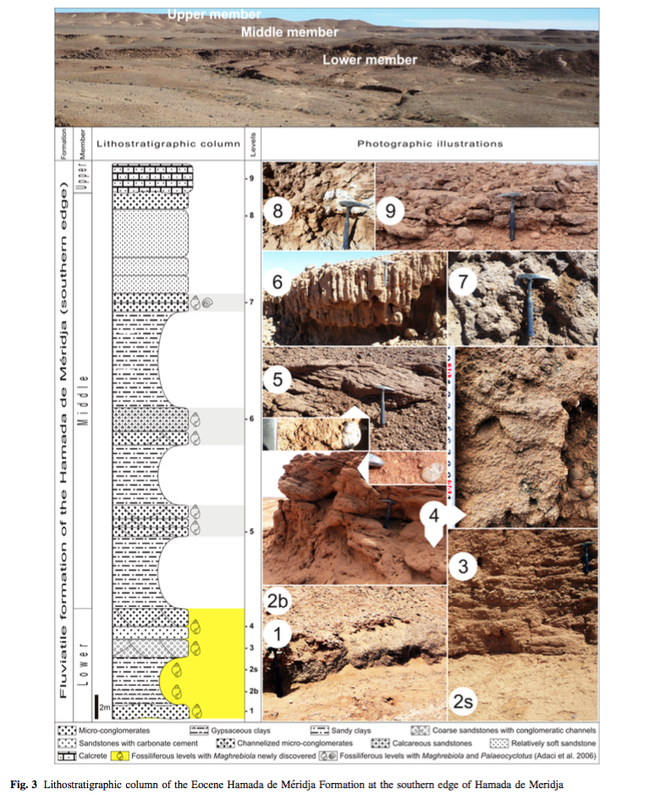 Here we analyse the faunal assemblage from the Hamada de Méridja Formation in southwestern Algeria, dated as Early to Middle Eocene on the basis of charophytes. The assem- blage consists of three closely related species that to date have been classified either in the extant Madagascan genus Leucotaenius v. Martens, 1860, or in the SW European Eocene genera Romanella Jodot, 1957 and Vicentinia Jodot, 1957. This is rejected for shell morphological and phylogeographical reasons, and a new classification as Maghrebiola gen. nov. is proposed. Maghrebiola is tentatively placed in the South American family Strophocheilidae, as species from the Early Eocene Itaboraí Basin of Brazil, currently placed in the genus Eoborus Klappenbach and Olazarri, 1970 in the family Strophocheilidae, superfamily Acavoidea, have a very similar shell habitus. This record possibly extends the known geographical range of the Strophocheilidae into the African continent during the Eocene. Immigration of this stock into North Africa during the Cretaceous via a still existing plate connection is assumed. An attribution of Maghrebiola to the African family Achatinidae is unlikely for shell morphological reasons despite certain habitus similarities, although the Priabonian genera Arabicolaria and Pacaudiella from Oman most likely belong into this family, and not to the Vidaliellidae as originally proposed. Possible causes for the very low diversity of the assemblage are mainly unfavourable living conditions, i.e. a relatively dry climate resulting in sparse vegetation and only occasional presence of water bodies, which may have had increased salinities, accounting for the lack of freshwater mollusks. The absence of any competing large gastropods may possibly have facilitated high intraspecific variability leading to sympatric occurrence of three closely related species, due to the animals occupying a wide range of available ecological niches. As the species discussed here have also been attributed to the genera Romanella and Vicentinia in the Vidaliellidae, we provide an appendix with annotated characterisations of most genera of the Vidaliellidae and list the nominal species assigned to them. This family is tentatively placed in the South American superfamily Orthalicoidea; its stock would have similarly immigrated from South America, but have successfully colonized mainly SW Europe, with only one Eocene species [Romanella kantarensis (Jodot, 1936)] recognized in Algeria”. This paper presents a provoking view on the relations between northern Africa, soutwestern Europe and South America during the Eocene. Perhaps food for discussion among palaeontologists? Hammouda, S.A., Kadolsky, D., Adaci, M., Mebrouk, F., Bensalah, M., Mahboubi, M. & Tabuce, R., 2017. Taxonomic review of the ‘‘Bulimes’’, terrestrial gastropods from the continental Eocene of the Hamada de Méridja (northwestern Sahara, Algeria) (Mollusca: Stylommatophora: Strophocheilidae? ), with a discussion of the genera of the family Vidaliellidae. – Paläontologische Zeitschrift, 91: 85-112. This entry was posted in Uncategorized and tagged Africa, brazil, europe, fossil, literature, strophocheilidae on April 18, 2017 by bramb. Fontenelle & Miranda have just published a paper on Megalobulimus. Their abstract reads “We studied the reproductive biology of Megalobulimus paranaguensis (Pilsbry & Ihering, 1900), a large and long-lived land gastropod from the Atlantic Rainforest of Brazil. The study was conducted at an urban park in the city of Santos, state of São Paulo. For 4 years, we counted the egg postures and annual eclosion rate of 32 captive snails and looked for associations between egg posture and the climatical variables of the period. The annual mean posture of 8.7 eggs per snail obtained in our results is a small number, but typical of Brazilian macromollusks. The annual eclosion rate was 31%. The beginning of the annual activity period of snails occurred in the middle of March, and lasted 33.97±3.02 weeks. The dormancy period started in the beginning of November, and lasted 18.39±3.11 weeks. There were two egg posture peaks, a minor peak between March and May, and a major peak between August and November, with greater values in September. Megalobulimus paranaguensis has a well-defined seasonal reproductive pattern influenced by environmental temperature and temperature range. Furthermore, in this snail, reproduction is negatively influenced by temperature increasing and temperature range”. This entry was posted in Uncategorized and tagged biology, brazil, literature, Megalobulimidae on April 7, 2017 by bramb. 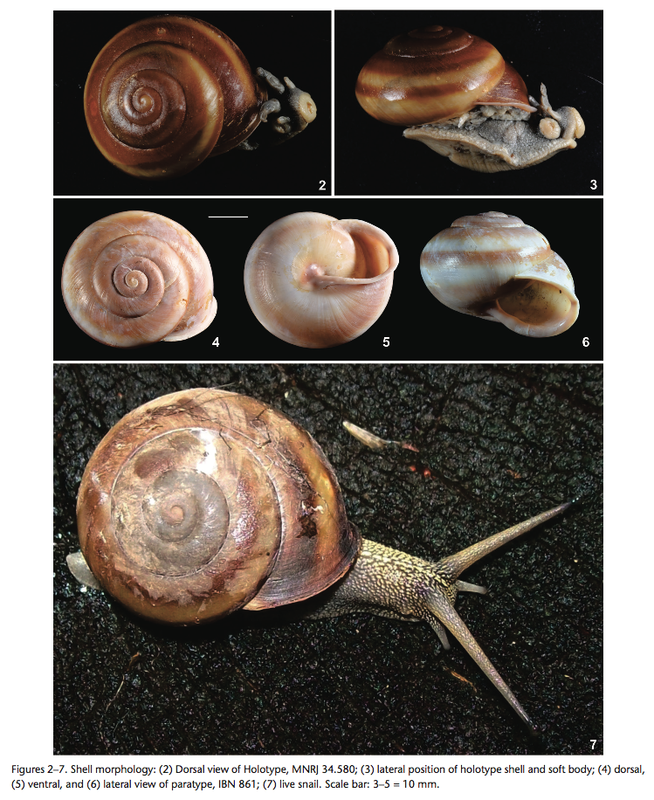 The Journal of Conchology has recently published some papers relevant to Neotropical land snails. 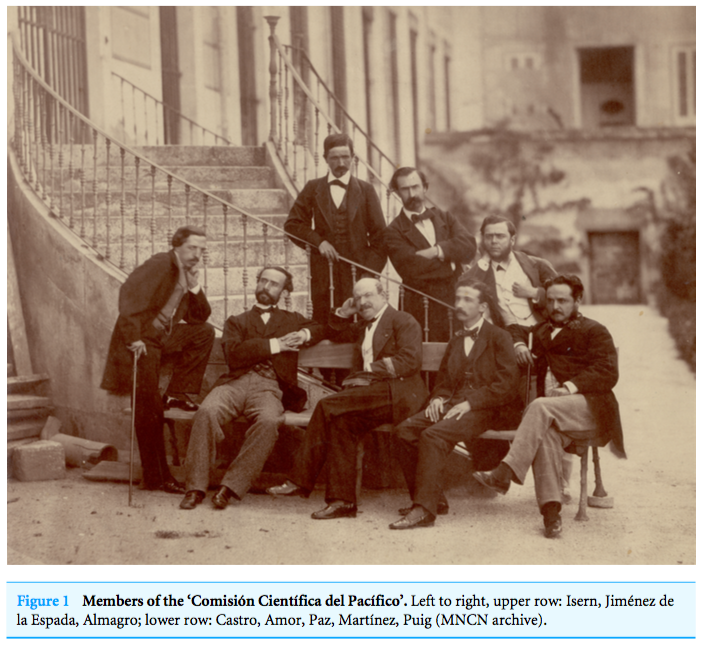 Today, I mention the paper by Porto et al. (2017) about Oxychona. The abstract reads “A new species of Oxychona was found during excursions to the Michelin Ecological Reserve (13°S), Southern Bahia State (Northeastern Brazil), which comprises an Atlantic Rainforest Conservation Unit. Living snails and empty shells were collected from ground litter accumulations and kept in an artificial environment supplied with local water and sediment, feeding on leaves of almond tree (Terminalia catappa L.). The new species is described and compared with others from adjacent areas of Brazil between 13oS and 15oS including O. bifasciata, O. currani and O. maculata. Oxychona n. sp. is likely to be endemic to Bahia State, thus supporting the biodiversity and rates of endemism of pulmonate molluscs to the Tropical Atlantic Rainforest in Southern America”. This is a very nice paper as the authors have taken the effort to include a key to Oxychona species. So, although this paper only described a single new species, it still has broader application. The authors also give anatomical and ecological details. The main author, Beth Neves, was kind enough to send me a short film of a living specimen of the new species, which I’m happy to share here. Porto, R., Rocha Filho, R. da, Johnsson, R. & Neves, E., 2016. New species of Oxychona (Bulimulidae) from Michelin Ecological Reserve (Bahia State, northeastern Brazil. – Journal of Conchology, 42: 105-110. This entry was posted in Uncategorized and tagged brazil, literature, oxychona, types on March 29, 2017 by bramb.